blue variegated leaf, sold by the Book or the Pack. Blue Variegated Leaf is made from composition metal leaf color #2½ and is the most difficult color to achieve and varies greatly from pack to pack. The added colors are black and purple with some blue and green highlights. The copper alloy in metal leaf will tarnish, therefore all metal leaf must be sealed to prevent tarnishing. 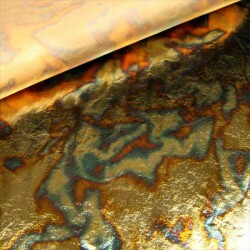 Variegated Leaf is metal leaf which has been treated to create colorful patterns in the leaf. The random patterns vary from pack to pack. Definition and Disclaimer - Definition of the word variegated: a) exhibiting different colors, especially as irregular patches or streaks. b) marked by variety. BASIC PRODUCT INFORMATION: Variegated Leaf is typically manufactured from Copper or Copper/Zinc alloy (Brass) Leaf. Variegated Leaf is produced by exposing the metal leaf to vapor containing acids or bases at varying temperature levels. Variegated Leaf has differing sides, meaning one side will have a differing pattern and color intensity from the opposite side of the same leaf. No variegated leaf is the same and variations from one leaf to the next may be extreme, even from leaf to leaf of the same color range, book, pack or lot. Blue Variegated Leaf - PackBuy Blue Variegated Leaf - Pack Sold in Full Packs (20 Books - 500 Leaves) Blue Variegated Leaf is produced from color #2 c..
Blue Variegated Leaf-1 bookBuy Blue Variegated Leaf-1 book for Sale here. Each book of Blue Variegated Leaf contain 25 Leaves 5-1/2" x 5-1/2" Average ..